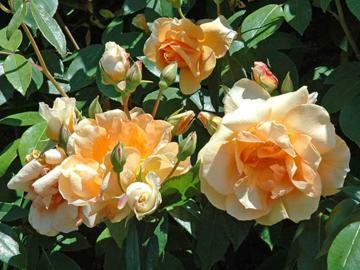 Vigorous climber with good foliage and very fragrant, semi-double to double, apricot-orange flowers, subltly fading as they age. Repeat blooming during summer. Fertile, moist, well drained soil in an open sunny position. Grows particularly well in warm climates. Covering walls or pergolas. The flower colour works very well against red brick.